During a sleepless night, in early spring of 2006 Mr. Mihály Vlaszák, managing director of Metalloglobus Metal Casting and Trading Ltd., was thinking about achieving spectacular performance related to the company’s activity, which, on the one hand strengthens the reputation of the company as well as an unforgettable experience for the people involved in it. Because he had a long interest in old games, old traditional values, the idea was born (! ), the obvious solution: to build the world’s largest tin-soldier! The idea was followed by actions. Careful research has revealed that the “World’s largest tin-solder” record is an existing achievement in the Guinness Book of Records. 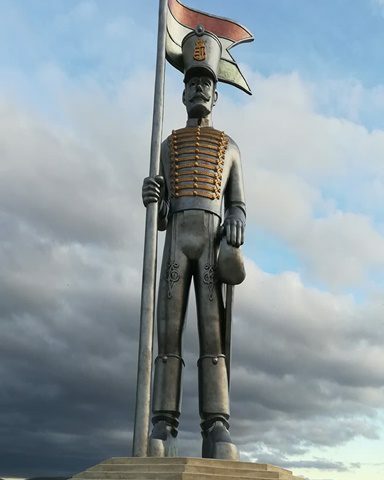 This is a 975-centimeter tall monster in Montgomery, Canada, near Vancouver, and is a permanent memorial to Andersen’s famous tin-soldier figure. Since all records can be decided, this is the size, that needs to be overcome. The first idea was to look for supporters and offer something to them in exchange. For this purpose, they preparing the Soldier in a reduced version, which gift would receive the sponsor / supporter combined with advertising space and appearance. However, their fundamental aspiration was not to motivate the participants with the money and the profit, but the strength of the community, the hit in the project, confidence and volunteering, as it was stated at the beginning of the beginning. To get the giant soldier ready, plans, drawings, basics are needed. Since Andersen’s soldier is a symbol of the love, and rivalis based on this, thus the famous figure of Hungarians, the brave Hungarian Hussar will be the model of the Hungarian recorder statue. For the time being, only the plaster, but by the end of summer 2006, the first one meter high soldier is ready. This hussar became, on the one hand, a pattern of later replicas, but also a base and template for the upcoming 12,5 meter giant soldier. In the autumn of 2007 next to the Danube, in the village of Rácalmás, a local construction company, Timpanon P + P Ltd. offered its premises, its building used formerly as a horsemanship, for that purpose to get 12.5 meter high form of Miska-hussar from the PUR foam here, and the necessary work can be done here. The next important day is the “Baptism Day” in Miska-Hussar’s life, which took place on June 28, 2008. At this time, during a local initiative, the Art-Porta Arts Harbor Festival the statue got the Miska-Hussar name. The naming ceremony was attended by hussars, the Scottish piper ask for blessing to the participants, to the success of the initiative, and according to the tradition of baptism, a priest christen the giant hussar, and asked for a blessing for the success of the initiative. At that time, the members of the creative community were still very optimistic about the completion of the statue. 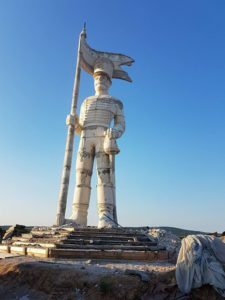 The 12-meter hussar was already made using insulation foam, however questions remained regarding the technology for the final casting and, indeed, the location for the final venue. 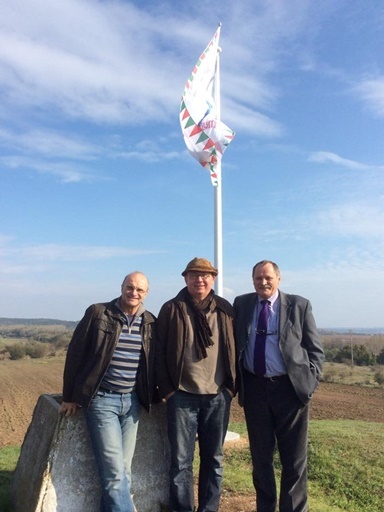 Although the Hussar sculpture was originally targeted to be placed in Pákozd, due to the victorious battle of 29 September 1848, the credit goes to Colonel Stephen Görög, leader of the Military Memorial Park in Pákozd, who found the final site for the statue. While the team were investigating several possible technologies, ROHO, the sculpter, plastered the statue. 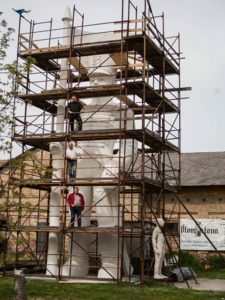 As the mould of the statue was completed earlier than the actual final technology was ready and before the ownership of the site was settled, Miska spent two weeks wrapped in nylon film. In 2015, the solution for the process was finally discovered and the sculpture was cast in concrete. The execution of the operation was performed by the enthusiastic team of ÖKO 2002 Kft with their excellent professional knowledge, led by László Somfalvi. In the first phase, the statue was formed and, once the suitable mould release layer was applied, they poured it with lightweight concrete. Approximately, 140 tonnes was used in this operation. Following this the extraction of the future casting moulds took place by tower crane. The 13 levels consisted of 2-3 segments per level. These casting moulds spent the winter in Rácalmás. The base of the sculpture was finished by the spring of 2017. Total material used was 110 tonnes of concrete and iron netting. The casting moulds, weighing 7-11 tonnes each, were transported from Rácalmás to Pákozd by special vehicles. The rods and casting with concrete was performed in layers. The summer heat was thoroughly testing the enthusiastic staff of ÖKO 2002 kft. They were extracting the statue of Miska-hussar from its concrete shell by layers from the top to the bottom. Approaching the final act to be completed by ROHO, the surface of the sculpture needed to be cleaned and a special coating of paint was to be applied. Despite the unbearable heat, he created something extraordinary. Compared to the operations described so far, the spatial planning and the creation of the surrounding environment were only minor tasks to be performed. 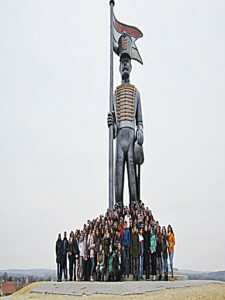 On September 29, 2017, the statue was unveiled by Dr. General Tibor Benkő, in the presence of military honours, a host of hussars and thousands of enquirers. Metalloglobus Fémöntő Kft does not intend to deal with sculptural casting again in the future nevertheless is proud of its contribution to the preservation of our national traditions in the field of social responsibility. We are confident that visitors to Miska-hussar will enjoy many pleasant moments and enjoyment of the statue just as much as the creators.